If you haven’t heard of the Oculus Rift, it’s a newly developed 3D virtual reality device that sits on your face like a large pair of goggles. It’s said to be immersive and quite amazing even at this early stage. It garnered a great deal of attention a few months ago, and then, when Facebook bought it for 2 billion dollars, even more press. 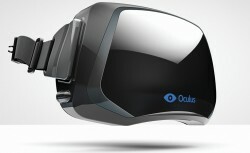 Without personally having the Oculus experience it’s hard to know what the excitement is all about. But clearly something is going on. Then I read this article about an elderly woman diagnosed with cancer, and having a wonderful experience just walking through a demo of a Tuscany village. The story points the way to future possible uses of such technology beyond gaming. And then I got to imagining a care home where instead of a room full of elderly folks staring at Jeopardy on TV, all the old folks are sitting around with Oculus goggles being tended to by robots made in Japan. They are swaying, and oohing and aahing at the worlds they are experiencing. The robots put ice tea in their hands but it’s not used to wash down a fistful of medications. Gosh, am I imagining my own future? Could be worse, I guess.